Fannie had an older sister Emma born in1881 and would soon have a brother a year and seven months later. Simeon D was born in Bowmanton as well but her next sister was born in Garden Hill (part of Port Hope), in 1887, which would suggest that her parents had moved there. By 1891,(2) Frances was living in Toronto with her mother and grandparents, on Queen Street in Toronto. Her father was not with them nor was her brother Simeon but there was a new addition Florence Victoria May, born in May of 1890. Florence only lived eleven months. Fannie would have been just eight when her father left in 1891. Her mother struggled to raise the children alone. As previously mentioned, I do not know if Frances knew what happened to her husband but she referred to herself as a widow, and no one in my family ever mentioned Simeon so it was a secret either never revealed or that no one was aware. ​ Fannie’s grandfather died in 1892 so it is quite possible that Frances and her mother Fanny and families were in the same place for several years. I have an address of 721 Queen Street East for the year 1899. 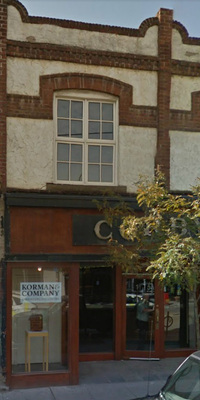 The place would have been an ideal spot for a tailor as it is a storefront with an apartment above. One of Fannie’s uncles had apprenticed with his father and might have continued on for several years until Fannie’s grandmother and her family moved out west to Saskatchewan. Fannie’s mother moved to 622 Queen Street East in 1901. So much has changed since then. These are now condo lofts. Fannie would have met Ben McEwan at school. He was the older brother of both Emma and Helen “Nell” McEwan and lived only a few blocks from her on Saulter Street. They all would have attended the Hamilton School near Dundas and Broadview. 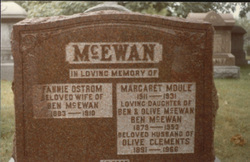 01531-00 (York) Benjamin MCEWAN, 21, fur cutter, Toronto, same, s/o John MCEWAN & Janet STEVENSON, married Fanny G. OSTROM, 18, Cantou Ont, Toronto,d/o Simeon C. OSTROM & Frances KNIGHT, witn: Emma OSTRAM and Harry KNIGHT both of Toronto, 10 April 1900 at Toronto, Congregational, Rev. J. P.GERRIE, licence reg. 9 May 1900. ​ The couple had their first child in September of the same year. They called their little girl by the name of May Irene. She lived only four months. I have been unable to find Ben and Fannie on the 1901 Canadian census. In November of 1901 John Benjamin was born but only survived one week. How hard it must have been for the young mother only nineteen and already two children had died. Fannie got pregnant again almost immediately after the loss of John Benjamin and this time in November of 1902 she gave birth to Frances Munro McEwan. Frances would live a long life. In 1903 the family was living on Gildersleeve Avenue, which bordered Riverdale Park on the south side. (4) see inset above This would have been a nice place for little Fannie in the day. It was also near Necropolis cemetery should she want to visit her first two children's gravesites. Their next child Edgar Irwin born in March of 1905, would also live to grow up and have a family of his own. McEWEN, Fanny, Gertrude, f, married, 5 Jan. 1910. 26 years, 10 mos., 25 days, Port Hope, Ontario died at Oak Avenue, Toronto, cause - acute nephritis duration 11 days, causing cardiac failure, housewife, father's name Ostrom, mother's name unkown, Toronto twp. (York Co.) 001107-10. Name of attending physician T. B. McDonald, 469 Parliament St. Toronto. Fannie is buried at Saint Johns Norway Cemetery and Crematorium in the Beaches area of Toronto, Ontario. ​ My mother always told me a story that was told to her by her grandmother. Apparently the doctor reported to the family that he had just come from the home of the most beautiful women he knew and unfortunately there was nothing he could do to save her life. I imagine how lovely Fannie would have looked in the furs that came from the furrier where Ben worked. That never was to be.